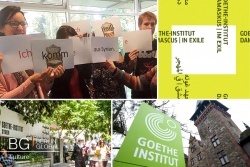 Cultural Exchange between Syria and Germany through the Event "Goethe-Institut Damascus | In exile"
Established in 1955, the Goethe-Institut Damascus was one of the first Goethe-Institutes in the worldwide. It closed in 2012 due to the security and political situation in Syria. Before its closure, the Institute was a meeting place for creative artists, students and partners from Germany and Syria. Many people who were connected with the Goethe-Institut Damascus were forced to leave Syria and live in exile in Europe. Most of them have the hope that one day they will return to Syria. From 20th October to 5th November 2016, a special event called "Goethe-Institut Damascus | In exile" will be held in Berlin. The event is a project run by the Goethe-Institut which aims to send a clear signal of hope for a better future for the Syrian people after the war in Syria. It will be held in an empty Berlin shop where some of the work of Goethe-Institut in Syria will be shown. The event will be used as a platform for art, culture, cooperation and exchange between Syrian artists in Berlin. The collaboration between Syrian and German filmmakers, artists, writers, musicians and curators will make the two-week program very interesting. It will include exhibitions, film series, performances, concerts and panel discussions. The versatile program of the "Goethe-Institut Damascus | In exile" will be related to topics such as homeland, escape and forced displacement. It will also show artistic creations by Syrian artists who are in exile in Berlin. One of the discussions which is included in the program of the event will be between the playwright and director Anis Hamdoun and the art critic Hanno Rauterberg. The talk will be related to the politicization of forced displacement in current contemporary art, discussing social responsibility in cooperation with artists who are refugees. During the event, a discussion with the President of the Goethe-Institut, Klaus-Dieter Lehmann, will also be held. It will concern the decline of the publishing industry in the Arab world and its impact on literature and readers in the region. As a part of the event, the well-known Syrian clarinettist and composer Kinan Azmeh will give a performance of ska (a music genre that originated in Jamaica) and jazz combined with classical Arabic elements. A film series representing Syrian cinema before the revolution and the beginning of the civil war in the country in 2011 will also be shown. A special exhibition called "70m²" is also taking place as a part of the event. For this exhibition, young Syrian artists and curators under the direction of the artist Nasan Tur will redesign the event site three times. Each redesign will be related to different topics. The program will also be accompanied by social meetings and coffee breaks. In addition, the site of the event will serve as a temporary library which will offer Syrian and German literature, magazines as well as books for children, self-learning materials, tablet and PC stations. Media partners of the event "Goethe-Institut Damascus | In exile" are ‘Deutsche Welle’, the radio station ‘Radioeins vom rbb’, and the magazine and daily newspaper ‘Rosegarden’. This page was last edited on 5 December 2016, at 11:33.